SOLBurner, Distortion from Benado Effects. 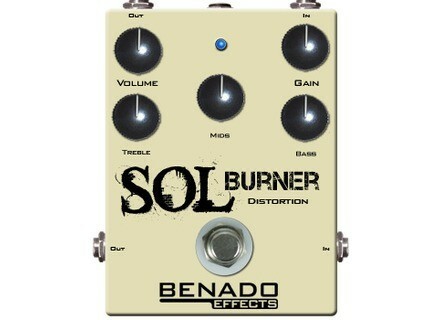 Benado Effects is introducing its SolBurner distortion effect fr guitar designed to sound like a Soldano. 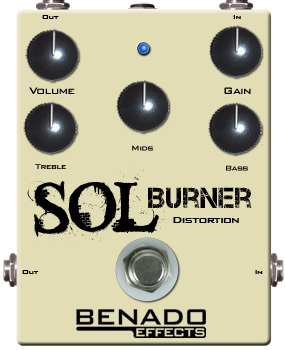 Benado got inspiration from Soldano's Supercharger and SLO-100 to create the SolBurner pedal. There are two inputs and as many outputs which can be used silmutaneously. Controls include a 3-band EQ, volume and gain, to be distributed among the ins/outs. The SolBurner effect is currently available as a pre-order at a price of $199 ($234 for international shipping). IK Multimedia Summer Strummer Special IK Multimedia has announced that from now until September 5th, 2012, they will be offering four waves of AmpliTube deals. [NAMM] 4 New Fender Antigua Finishes Fender has announced a limited run of instruments featuring its rare Antigua finish. [NAMM] Gibson Les Paul Junior Special P-90 Gibson introduces its new Les Paul Junior Special P-90, in Gloss and Satin finishes.